(Francisco Kjolseth | The Salt Lake Tribune) Ramen with shredded pork, scallion, soft egg, enoki mushroom, nori and kimchee at Hearth & Hill a new restaurant in Kimball Junction that serves upscale comfort food at 1153 Center Drive in the Newpark Retail Center is one of the new restaurants available to try before (or after) the Sundance Film Festival. Park City • The annual Sundance Film Festival starts its 11-day run on Thursday, and diners with independent spirits will want to check out these new — or updated — restaurants in Park City before the movies start or after the credits roll. Two of these new options — Hearth & Hill and Thai So Good — are at Kimball Junction, which offers easier parking and more affordable prices. Two others — Provisions by Riverhorse and Blind Dog — are old favorites with new offerings. And, finally, 7-8-8-0 Club offers everyday folks a chance to see the exclusive Stein Eriksen Residences at Deer Valley — without an overnight stay. (Francisco Kjolseth | The Salt Lake Tribune) Hearth & Hill a new restaurant in Kimball Junction that serves upscale comfort food at 1153 Center Drive in the Newpark Retail Center is one of the new restaurants available to try before (or after) the Sundance Film Festival. (Francisco Kjolseth | The Salt Lake Tribune) Hearth & Hill a new restaurant in Kimball Junction that serves upscale comfort food at 1153 Center Drive in the Newpark Retail Center is one of the new restaurants available to try before (or after) the Sundance Film Festival. (Francisco Kjolseth | The Salt Lake Tribune) Daily gyoza at Hearth & Hill a new restaurant in Kimball Junction that serves upscale comfort food at 1153 Center Drive in the Newpark Retail Center is one of the new restaurants available to try before (or after) the Sundance Film Festival. (Francisco Kjolseth | The Salt Lake Tribune) Hearth & Hill a new restaurant in Kimball Junction that serves upscale comfort food at 1153 Center Drive in the Newpark Retail Center is one of the new restaurants available to try before (or after) the Sundance Film Festival. (Francisco Kjolseth | The Salt Lake Tribune) Hearth & Hill a new restaurant in Kimball Junction that serves upscale comfort food at 1153 Center Drive in the Newpark Retail Center is one of the new restaurants available to try before (or after) the Sundance Film Festival. (Francisco Kjolseth | The Salt Lake Tribune) Hearth & Hill a new restaurant in Kimball Junction that serves upscale comfort food at 1153 Center Drive in the Newpark Retail Center is one of the new restaurants available to try before (or after) the Sundance Film Festival. (Francisco Kjolseth | The Salt Lake Tribune) Hearth & Hill a new restaurant in Kimball Junction that serves upscale comfort food at 1153 Center Drive in the Newpark Retail Center is one of the new restaurants available to try before (or after) the Sundance Film Festival. (Francisco Kjolseth | The Salt Lake Tribune) Hearth & Hill a new restaurant in Kimball Junction that serves upscale comfort food at 1153 Center Drive in the Newpark Retail Center is one of the new restaurants available to try before (or after) the Sundance Film Festival. (Francisco Kjolseth | The Salt Lake Tribune) Hearth & Hill a new restaurant in Kimball Junction that serves upscale comfort food at 1153 Center Drive in the Newpark Retail Center is one of the new restaurants available to try before (or after) the Sundance Film Festival. (Francisco Kjolseth | The Salt Lake Tribune) Hamachi crudo with chile, lime, scallion, white soy, and toasted sushi rice cake at Hearth & Hill a new restaurant in Kimball Junction that serves upscale comfort food at 1153 Center Drive in the Newpark Retail Center is one of the new restaurants available to try before (or after) the Sundance Film Festival. (Francisco Kjolseth | The Salt Lake Tribune) Ramen with shredded pork, scallion, soft egg, enoki mushroom, nori and kimchee at Hearth & Hill a new restaurant in Kimball Junction that serves upscale comfort food at 1153 Center Drive in the Newpark Retail Center is one of the new restaurants available to try before (or after) the Sundance Film Festival. (Francisco Kjolseth | The Salt Lake Tribune) Sundae Nachos with chocolate waffle, puzzle cookies, banana, coconut almond ice cream, hot fudge, caramel sauce, fresh berries, almonds and whipped cream at Hearth & Hill a new restaurant in Kimball Junction that serves upscale comfort food at 1153 Center Drive in the Newpark Retail Center is one of the new restaurants available to try before (or after) the Sundance Film Festival. (Francisco Kjolseth | The Salt Lake Tribune) Brooks Kirchheimer, co-owner of Hearth & Hill a new restaurant in Kimball Junction that serves upscale comfort food at 1153 Center Drive in the Newpark Retail Center is one of the new restaurants available to try before (or after) the Sundance Film Festival. Hearth & Hill • This casual eatery in Kimball Junction has an impressive pedigree, starting with its owner, Brooks Kirchheimer, who has worked for more than a decade in the restaurant industry, including stints as the manager of Daly’s Pub at Montage Deer Valley and Sundance Resort’s Zoom restaurant. Kirchheimer hired executive chef Jordan Harvey, formerly of Zoom and Montage, to lead the kitchen, and Mia Yue, from High West Distillery and Firewood on Main, as general manager. As the name suggests, the menu at Hearth & Hill is upscale comfort food with soup, salads, sandwiches ($8 to $16) and large entrées sprinkled with global and gourmet flavors like the kicky Korean fried chicken with waffles ($26) and the Utah trout with gnocchi ($28). The gyoza (pot sticker) appetizer ($9) changes every day, the truffle mac and cheese is a decadent side dish ($10) and if you’re in a large group, the sundae nachos — chocolate waffles topped with fruit, ice cream, hot fudge and caramel sauce — is a massive dessert for the whole table ($10). There is a full-service bar for those 21 and older and a children’s menu for those who aren’t. Where • 1153 Center Drive, Newpark Retail Center (between Jupiter Bowl and Best Buy); 435- 200-8840 or https://hearth-hill.com/. 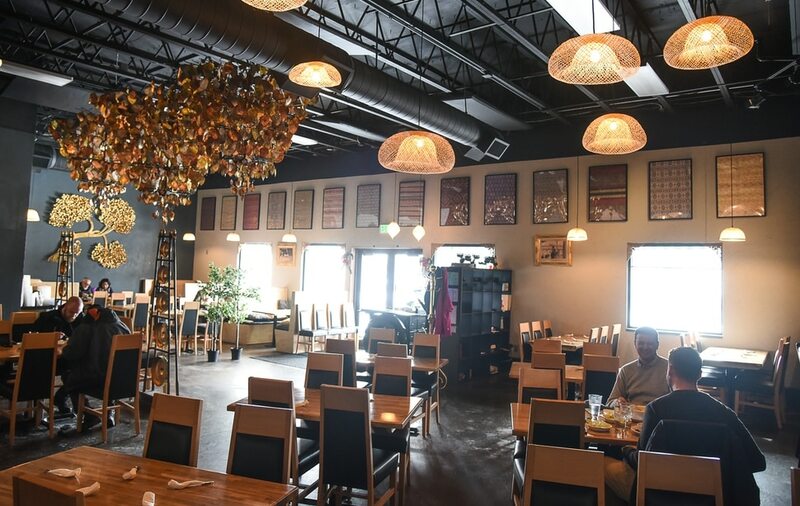 Open daily, 11:30 a.m. to 10 p.m.
(Francisco Kjolseth | The Salt Lake Tribune) Thai So Good, a new restaurant in Park City at 1764 Uinta Way, Unit D-1, at Kimball Junction is a place people can try before (or after) the Sundance Film Festival. (Francisco Kjolseth | The Salt Lake Tribune) Thai So Good, a new restaurant in Park City at 1764 Uinta Way, Unit D-1, at Kimball Junction is a place people can try before (or after) the Sundance Film Festival. (Francisco Kjolseth | The Salt Lake Tribune) Pad Thai at Thai So Good, a new restaurant in Park City at 1764 Uinta Way, Unit D-1, at Kimball Junction is a place people can try before (or after) the Sundance Film Festival. (Francisco Kjolseth | The Salt Lake Tribune) Thai So Good, a new restaurant in Park City at 1764 Uinta Way, Unit D-1, at Kimball Junction is a place people can try before (or after) the Sundance Film Festival. 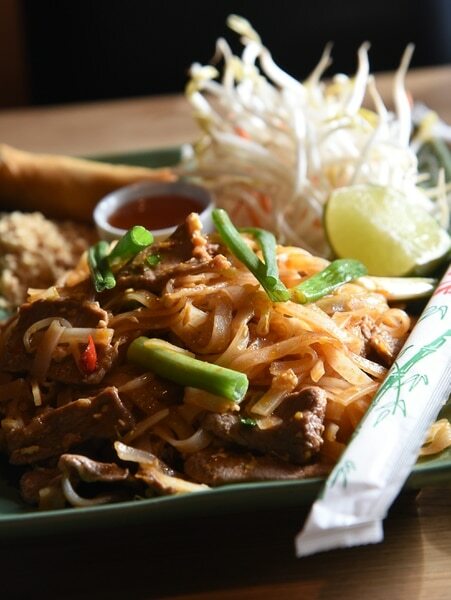 (Francisco Kjolseth | The Salt Lake Tribune) Pad See Eiw with stir fry rice noodles at Thai So Good, a new restaurant in Park City at 1764 Uinta Way, Unit D-1, at Kimball Junction is a place people can try before (or after) the Sundance Film Festival. 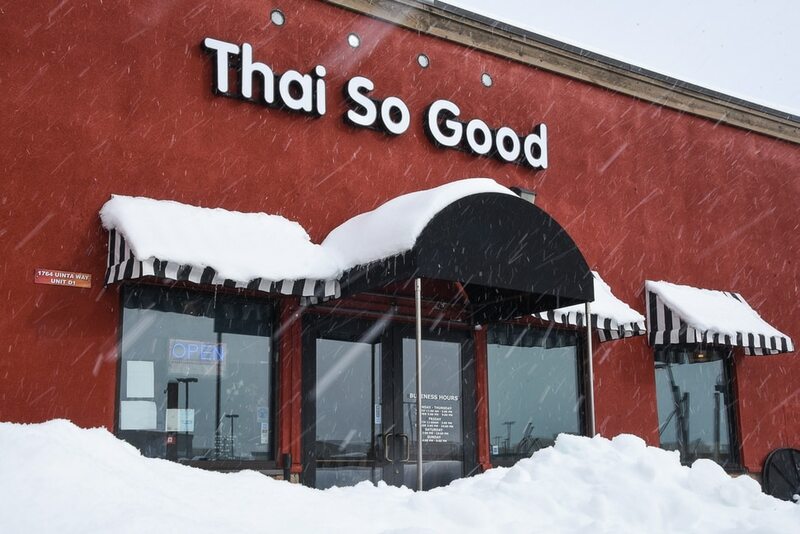 (Francisco Kjolseth | The Salt Lake Tribune) Thai So Good, a new restaurant in Park City at 1764 Uinta Way, Unit D-1, at Kimball Junction is a place people can try before (or after) the Sundance Film Festival. (Francisco Kjolseth | The Salt Lake Tribune) Massaman Curry and Garlic and Black Pepper chicken at Thai So Good, a new restaurant in Park City at 1764 Uinta Way, Unit D-1, at Kimball Junction is a place people can try before (or after) the Sundance Film Festival. Thai So Good • Also in Kimball Junction, this new restaurant offers all the favorite curries, stir fries and noodle dishes one expects from a stellar Thai eatery. Fill up with the $12 lunch special that includes salad, white or brown rice, a deep-fried spring roll and choice of two entrées. Among the 15 options are red, green, yellow or massaman curry; hot and sour soup; ginger stir fry with chicken; and tofu and vegetables. Where • 1764 Uinta Way, Unit D-1, Park City, 435-565-6989 or https://www.thaisogoodatkimball.com/. Open Monday-Friday, 11 a.m. to 3 p.m. and 5 to 9 p.m.; Saturday, noon to 9 p.m.; and Sunday, 4 to 9 p.m.
7-8-8-0 Club • This new restaurant (and lounge) — inside the exclusive Stein Eriksen Residences — is open to the public daily for breakfast, lunch, dinner and après ski. Entrées include the Stein burger ($21), butternut squash risotto ($25) and wagyu short ribs ($34). Lunch ranges from $14 to $24 and includes sandwiches, salads, a signature white chili and pulled pork and chorizo tostada. Where • 6702 Stein Circle, Park City; 844-494-4504 or https://steineriksenresidences.com/stein-eriksen-dining. Open daily, 7 a.m. to 9 p.m. Blind Dog • To celebrate its 20th anniversary, this popular restaurant closed for 10 days in October to undergo a major renovation. The result is a brighter look with bare brick and backlit bars. The menu also was restructured to include a new raw bar with fresh oysters, shrimp, crab, lobster and poke on ice, as well as sushi, nigiri and sashimi. The restaurant also added new gluten-free and vegetarian options, while keeping the comforting favorites such as owner Penny Kinsey’s signature meatloaf, a mix of heirloom pork and kobe beef; the crispy yardbird chicken; and the three-cheese macaroni. Half-price appetizers and sushi are still available every day from 5 to 6 p.m., and there’s a $5-a-glass wine list. Where • 1251 Kearns Blvd., Park City; 435-655-0800 or https://www.blinddogpc.com. Open daily at 5 p.m.
Trent Nelson | The Salt Lake Tribune Provisions by Riverhorse, grab-and-go café, deli and specialty market — which opened at the top of Main Street in 2017 — has added a dinner menu. It’s available nightly from 4 to 9. 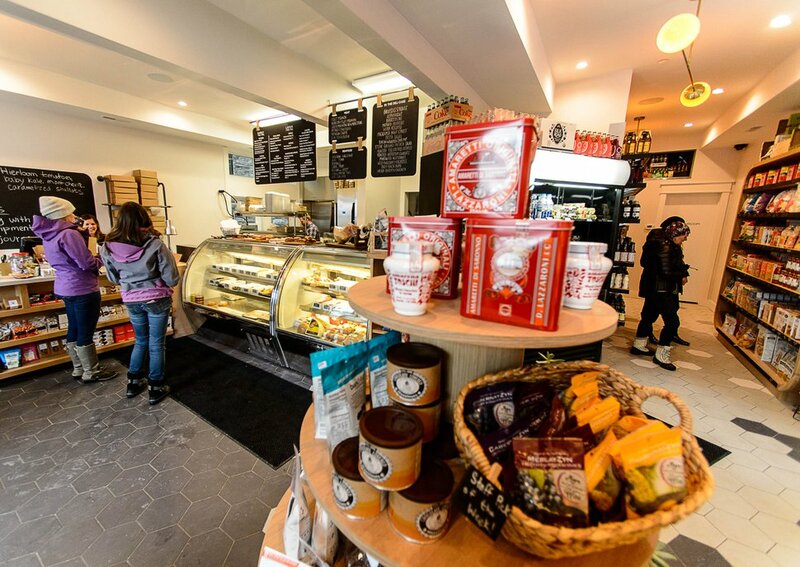 Provisions by Riverhorse • This grab-and-go café, deli and specialty market — which opened at the top of Park City’s Main Street in 2017 — has added a dinner menu. It’s available nightly from 4 to 9 and includes smoked barbecue baby back ribs, shrimp ramen, goat-cheese-stuffed chicken and buffalo short rib stroganoff. Wine, beer and housemade cocktails are available. There’s also a children’s menu. Guests are served on a first-come, first-served basis. Where • 221 Main, Park City; 435-649-0799 or https://www.riverhorseprovisions.com/. Open daily, 7:30 a.m. to 9 p.m.